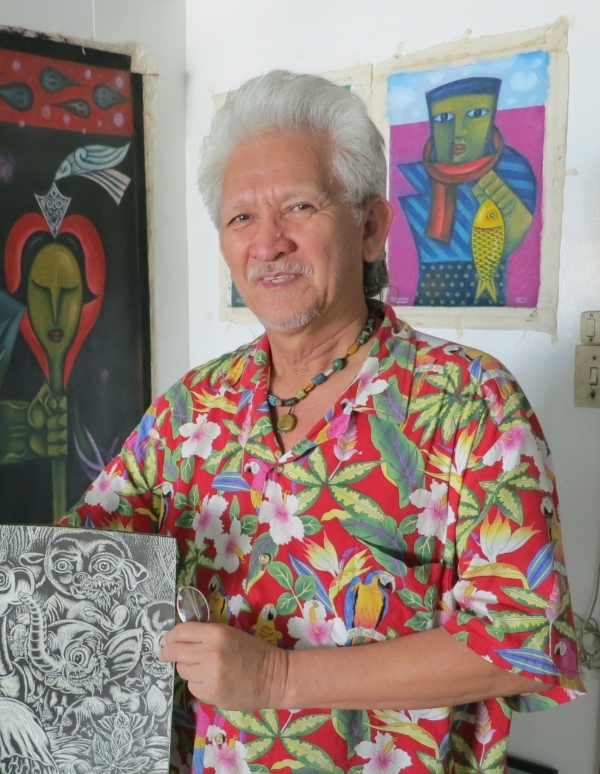 Born in 1950 in the Philippines, Nunelucio Alvarado is active on the South-East Asian art scene since the beginning of the 1970’s. He presently lives and works in Bacolod, province of Negros Occidental, Philippines. He studied Fine Arts at the University of the Philippines Diliman in Manila. He is well known for his progressive artworks that depict the faces, the plights and struggles of the Negros-based “sakadas” (labourers hired from outside) and other marginalized populations. He has developed a unique and unmistakable style that stands out with its strong colours, emotions and strength. He is one of the 4 founding members of the “Black Artists in Asia” a very important politicised art group of the 1980s’. Important museums have acquired his works: Singapore Art Museum, Metropolitan Museum of Manila, Fukuoka Asian Art Museum as have private collectors in the Philippines and abroad. Fuman Art has been working with Nunelucio Alvarado for a couple of years now and we are planning a show in our gallery in Paris (France). Click here to view Nunelucio Alvarado’s available artworks.